Dial-a-Mum is an organisation of professionally training volunteer mothers who offer support understanding and a friendly ear. We are the mum to the community and are there to offer empathy and understanding for those who are upset, worried or lonely and just want to talk to a mum. Calls are confidential. We do not judge. We do not promise to solve problems. It is surprising how nice it is to be heard by someone who is prepared to listen. 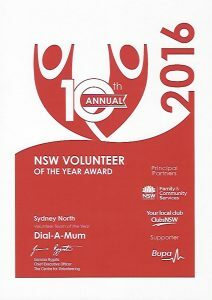 We were awarded the 2016 Sydney North Volunteer team of the year. – design and implement a marketing strategy to attract more callers, using both digital and traditional media. It should be a relatively short term job for someone with the rights skills. You would be making a huge contribution to out organisation by helping us to reach more people by making them aware of our service. Please call (02) 9477 6777 if you would like more information. Please quote in application: Marketing and Advertising Support Volunteer via Pro Bono Australia.